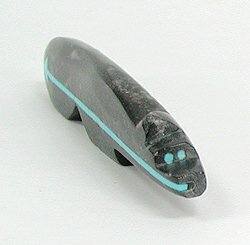 Orthoceras bear with turquoise eyes and heart line. "This amazing bear has an Orthoceras fossil on one side that looks like echos of sound waves from eons past. On the other side is a turquoise heart line the entire length of the bear." Orthoceras date back to the Silurian Age over 400 million years ago. They are the earliest recognizable animals. Able to swim and crawl, Orthoceras ranged in size from a few inches to over six feet long. When they died, their shells fell to the ocean floor and after being covered by sediment, were transformed into stone.